Now out of beta, Google Desktop 4 is available in 26 languages plus a Japanese beta version. Read more?at Inside Google Desktop. 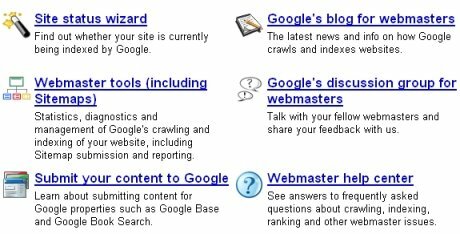 Google Sitemaps has been renamed to Google Webmaster Tools and there’s a new Google Webmaster Central Blog, your one stop source for information regarding crawling and indexing on Google. Google Webmaster Tools provides tools and information to keep you informed and increase your crawl coverage and visibility on Google. For example, if you notice your site is being indexed using both versions of your domain (www and non-www), you can now tell Google?your preferred domain URL format for crawling and indexing. Check it out. eWebPages Web Directory has finally launched and is doing well. We’ve received a nice number of quality submissions to populate the categories. We appreciate their support! eWebPages Web Directory is a professionally edited, searchable, general web directory.